Wisconsin governor and 2016 GOP candidate Scott Walker officially suspended his presidential bid on Monday during a news conference in Madison, Wisconsin. Like former rival Rick Perry, the Republican governor managed to slip in a few jabs at billionaire business mogul Donald Trump for taking the party in a more negative direction, but for the most part, Walker's dropout speech was positive in nature. By removing himself from the equation, Walker argued, he had made room for more productive GOP candidates to garner support among the broader constituency. 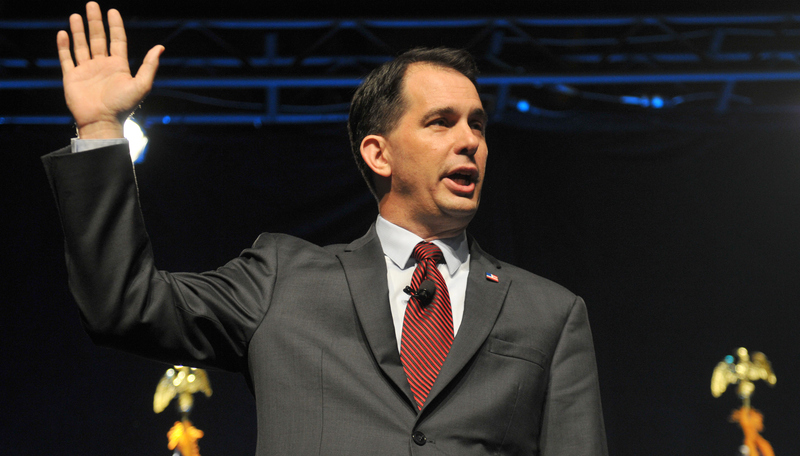 "As a kid, I was drawn to Ronald Reagan because he was a Republican and a conservative — but most of all, I admired him because of his eternal optimism in the American people," said Walker during Monday's news conference. "That thought came into my head when we were all standing on the stage at the Reagan Library last Wednesday: Ronald Reagan was good for America because he was an optimist." Walker then explained that the debate among the current GOP field was not one that honored Reagan's legacy, but rather one that focused on negativity and backbiting: "Sadly, the debate taking place in the Republican party today is not focused on that optimistic view of America." He indirectly cited candidates like Trump, who has made a habit of publicly insulting his rivals' looks and personal histories: "Instead, it has drifted into personal attacks." We are a party that believes that people create jobs, not the government. The best way to grow the economy is to get the government out of the way and build it from the ground up. We are a party that believes that the way to measure success in government is by how many people are no longer dependent on the government, because we ultimately believe in the dignity of work. We are the party that believes that a strong military leads to peace through strength, and that that will protect our children and future generations — that good will ultimately triumph over evil. We are a party that believes in the American people, not the federal government. These ideas will help us win the election next fall, and more importantly, these ideas will make our country great again. Like Perry, Walker indirectly referenced Trump's 2016 campaign slogan ("Make America Great Again"), eager not to go out without a fight — although the Wisconsin governor was careful not to summon Trump's name itself.